The slow shift has been going on for years now. The Tayloristic organisation, where everybody has a clearly defined and assigned job, often does not work so well. Especially when the assignments are not so clearly defined, more flexibility is required. The jobs become more flexible, and employees get the opportunity to craft their own job, to make the best fit with their wishes, needs and their capabilities. Some organisations go beyond job crafting. When there is an assignment, there is a process to look at the capabilities (qualitative and quantitative) required for this specific assignment. The wishes, needs and capabilities of people connected to the organisation are known, or captured as part of the process. A team is established, where the availability of people and the requirements of other teams must be taken into account. Teams are not build of people with specific fixed jobs, but by people who have specific skills that are needed to deliver the assignment. People with broad skill sets, can use certain skills in Team A, and other skills in Team B at their next assignment. The leader of Team A, who has specific skills in building new teams, might be the agile coach in Team B, as she is also very good in agile coaching. In this new situation, it is not possible to assign static job names to people. What do we do without jobs in HR? Many HR practices in use today, were designed in the last century, when many organisations were clear hierarchies, and when jobs were the main building block of organisational structures. The practices need to be redesigned, on order to be able to add value in new and transformed organisations. Most HR practices are based on static jobs, and most of the practices are focused on individual employees and candidates. Recruitment: based on the job profile and job advertisement is prepared, and individual candidates are invited to react. Most reward systems are based on some form of job evaluation. Career paths show how you can move from one job to another, preferably up the ladder. Traditional succession management is making overviews of the people who are suitable successors for the top jobs in the company. 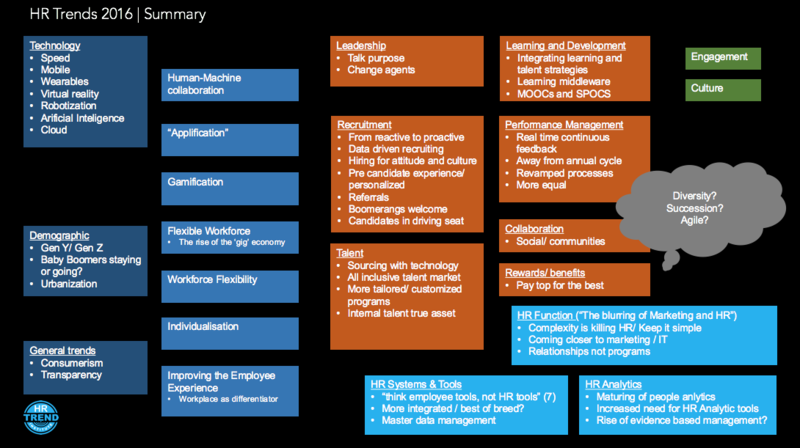 The first question the implementation teams of HR Information Systems ask is the org chart. If the reporting lines are not clear, the system cannot work. Entering an employee without a boss is very difficult. Time for a transformation in HR. This is not so easy, as the transformation is taking place on (at least) two axes: from analogue to digital, and from traditional to innovative HR practices. When you are making traditional processes digital, without redesigning the process, you can waste a lot of time and money. Justin Berg, Jane Dutton and Amy Wrzesniewski: What is job crafting and why does it matter? John Hansen: The future is about tasks, not jobs! Phil Wainewright: Is HR ready to carry the burden of digital transformation?